I know many fans of the Gaither Vocal Band urged the powers that be (Bill Gaither ) to record something that wasn’t stacked to high heaven, over orchestrated and generally overproduced. A cry for a more real and straightforward record was heard. I was one of them, so when I heard of an album in the making that would be kept pure, and simple I was kinda excited to say the least. Now without further delay, here’s my view on the album. The album opens with a song entitled ‘Rasslin’ Jacob’ it seems that the arrangement that The Dixie Hummingbirds used on their Diamond Jubilation: 75th Anniversary album was the Vocal Band’s mold, it’s almost exactly the same. Michael English takes the lead vocals and this is the kind of song he carries very well. 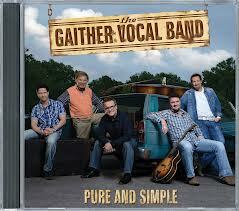 Bill Gaither sings nice bass lines, the other guys sound great, but the mix sounds kinda muffled . I would have liked to hear more dynamics, the tenor part isn’t prominent enough. The Dixie Hummingbirds version is different in that respect, the Vocal Band’s cut kinda sounds like a solo effort by Michael English, the vocals backing him up could be anyone, I like to be able to pick out each singer’s individual part. The ending by the Gaither posse is where they leave the arrangement of the Dixie Hummingbirds, they shift to unison before ending in modern harmony and that is also where the parts can be identified and I love it. ‘Come To Jesus’ is a David Phelps feature, this song written by Mindy Smith is drenched in fiddles, mandolins. Although it’s a great song, and David Phelps sounds like he always does (which is great), this too sounds like something that would be considered a solo effort. The harmonies are stellar but too muffled, not expressive, just awesome BGV’s. There’s a lot of reverb and echo on this song, not really simple and or pure but it adds to the atmosphere of the tune. If you judge this song on its own merit, it’s a stunning song, but I can’t help listening to it as a GVB effort, and that’s where I am somewhat disappointed. ‘I Don’t Want To Get Adjusted’ doesn’t disappoint, again Michael shows he’s still a monster of a lead singer, and he makes this song his own. The harmony vocals are awesome but again to modest in the mix, I miss brilliance, the highs and lows are too intertwined. I am the first to admit that this is a matter of taste, so to each his own. ‘Glorious Freedom’ is one of my favorite songs ever written, love the build, the construction of the song, and lyrically it’s the ultimate in expressing the perk we Christians get when we make Him our choice. I love how the guys come in on the verse, here you can hear that little to no stacking of the vocals was done..awesome! Love this song. ‘Whole Lotta Shakin’ Going On’ is a Mark Lowry feature, at first I didn’t care for this song that musically resembles the Peggy Lee song ‘Fever’. But the subtle ad-libs by the other guys, make me appreciate it more and more. Michael especially has some great ones. Also Bill Gaither can be heard prominently on the 3:00 mark, doing something I heard the bass-singer of The Delta Rhythm boys do, on a Nat ‘Cannonball” Adderley’s composition entitled ‘Work Song‘. Bill is loudly singing a deep and breathy ‘whoo’. As you should be able to figure out, I’m a sucker for details and this kind of stuff get’s me excited. Like this song very much. Lehman’s ‘The Love of God’ is amazing. Vocally it’s perfectly arranged, the track is breathtaking. It’s very, very slow, and it may not something you would love to play all day without getting depressed. But if you’re in the mood for something melancholic, yet uplifting this is the song you wanna play! ‘Do You Wanna be Well’ is a Wes Hampton feature, if I didn’t knew any better I would have thought Ricky Skaggs sang the lead. Wes sounds just like Ricky did in the 80’s, this song is the embodiment of easy-listening music. Lovely, lovely tune, and after the dragging, heavy funeral march tempo of ‘The Love of God’, you’re suddenly feeling carefree and happy again. Charles Johnson’s ‘Winds of This World’ is next, what can I say? Michael was born to sing this kind of song. He’s just built for it. Love this song, there’s one thing though that bothers me in this song, and that’s the third verse, I will tell you what bothers me. After the awesome and powerful piano-solo that is situated between the second verse and the third, the track seems to collapse. The piano seems to be wrecked after the beating that it just took . The piano is turned down so radically in the mix it doesn’t make sense, you think ‘what happened to the pianoplayer? Later in the chorus the piano can be heard better, and the song picks up momentum when a choir is added to the mix to work to a great finally. Great song, awesome vocals by all the guys, the only ‘flaw‘ is the third verse and the lack of the piano in the mix after that genius solo. ‘Rumormill’ written by Jon Mohr is a Mark Lowry feature, love the lyric of this song, and the track is also great. Great guitar playing on this track. Not my favorite cut on the album, but a good remake of this song. Another remake is next, and a lovely one! Michael sings the lead on ‘The Old Rugged Cross Made The Difference’. Never heard a better of interpretation of this song. I always regarded The Imperials version of this Gaither classic as the ultimate rendition till now. Awesome, especially David and Michael’s voice compliment each other more than I ever heard. David is featured on ‘Fool’s Gold’ a haunting song, that fits David’s equally haunting voice. “Cup of Sorrow” a Amos Lee tune that was featured on Lee’s ‘Mission Bell’ album is a Michael English feature, and it’s one of my favorite tunes on the entire album. The inclusion of an electric guitar, a Hammond B3 on this song on the predominantly acoustic track is a good call. Overall that was a good call, I think an all acoustic album would have been boring. Love the mandolin solo that follows the somewhat honky-tonk piano solo! The harmonies are stellar, and the tune demands you to sing along. Awesome song! Teddy Huffam’s ‘I’m Rich’ is so awesome, David has the lead, on this song is where the full potential of this all-star GVB is heard for the first time in a long while. Beautiful harmonic inversions, and modern harmonies. “I’ll Pray For You’ is the most beautiful song I ever heard, never have I heard Wes Hampton sing better! The track is also one of the most beautiful I ever heard. The track opens with a simple piano, you can hear the sound of the mechanics of the keys. Breathy BGV’s by the rest of the guys join in, an acoustic guitar is added, a mandolin. A beautiful chamber orchestra is added to the mix, strings that don’t sound bluegrassy, or country. I was reminded of Schindler’s list, the track has a jewish feel to it. One of the most beautiful songs ever by anyone. “Sow Mercy’ written by Reba and Dony McGuire, is one of those songs that sound like you’ve known it forever. Message is great, musically not really special. Mark Lowry is still one of the best and most solid singers in the business, very consistent. A must buy for everybody who loves well crafted and produced music. Ben Isaacs did a great job on this one. A surprising album, that might prove to be an acquired taste to some, or an instant favorite. All in all I love the album, although overall I think the harmony voices sound too much like BGV’s.